Each and every year, thousands of people suffer serious, debilitating injuries in tractor-related accidents. Or, even worse, people lose their lives in these awful accidents. According to the National Agricultural Tractor Safety Initiative, tractors are responsible for approximately 130 fatalities annually. That is half of all farm worker deaths. According to the National Safety Council, a shocking 44 percent of all tractor accident deaths were caused by overturned tractors. Between 1992 and 2001, over 2,100 people died in accidents involving farm tractors. Many of these awful deaths caused by tractor accidents could have been avoided with more stringent safety protocols on farms and other businesses. Watch Youtube Video(s) – The first video below is illustrative of the steps that can be taken to reduce the occurrence of injuries and death resulting from farm tractor accidents. The second video depicts how quickly loss of control of a tractor can occur -- endangering the lives of all in its path. In addition to farm tractor rollovers, another factor in serious tractor accidents is poor manufacturing or design of tractors. Modern tractors are legally obligated to be manufactured with rollover protection systems. In fact, rollover protection systems were mandated to be included in tractors by the U.S. Department of Labor. This means all new tractors are required to have some form of rollover protective structures. Furthermore, tractor operators are now required to get higher levels of training before they can use of these massive, complex vehicles. However, older model tractors are not equipped with this safety feature. You may be asking yourself, “how many old tractors are still in use or lack this safety feature?” Well, approximately 50 percent of the 4.8 million tractors operating in America do not have rollover protection systems, or even seat belts. Yes, you read that correctly – many tractors lack seat belts. Many tractors also lack roll bars or protective cabins in the tractors. The study showed that approximately 23 percent of people injured in a farm tractor accident required at least one day in an intensive care unit. Many others required days, weeks, or months of intensive medical treatment to recover from their bodily injuries. If you or a family member suffered a serious injury in an accident involving a tractor, you may be able to file a personal injury claim to seek financial restitution for your harms and losses. This means if you were hurt while working on a farm worker or if you or a loved one was hurt while operating a tractor, you can pursue monetary compensation. The types of compensatory damages you can pursue through a personal injury claim include reimbursement for the costs associated with your medical treatment. This would include reimbursement for the cost of treatment you have already received and for the costs of medical treatment you will most likely need going forward. In addition to reimbursement of medical costs, you can seek reimbursement for your lost income. If the tractor accident impacted your salary or hourly wage, you can pursue a recovery of those lost funds. This includes time missed from work by using vacation days and sick days. In addition, you can seek compensation for future wages if your injuries are so severe that a doctor has determined you cannot return to work. You can also pursue damages for the emotional strain and psychological damage associated with suffering a serious injury in a tractor accident. These damages are commonly referred to as “pain and suffering” damages. If you are thinking about filing a personal injury claim against the tractor manufacturer, the farm owner, or another part, you may be asking yourself, "what exactly is my personal injury case worth?" The answer depends on the specific facts of your case. The amount of damages you could reasonably expect to recover is influenced by the amount of economic and non-economic damages you suffered from the accident. For example, someone who suffers a traumatic brain injury, is totally incapacitated, and will require a lifetime of medical care is more likely to recover a substantial sum of money than someone who suffered a soft tissue low back injury. Another influencing factor is the amount of available insurance coverage. This will depend on which parties could potentially be held liable for causing the accident. California courts have adopted a comparative negligence standard when determining how to award damages in a personal injury or wrongful death lawsuit. Comparative negligence means that a judge and jury can review the fault of both the plaintiff and the defendant, or defendants, and assign a percentage. This percentage will then be used to reduce a damage award. For example, if you suffered $100,000 in economic and non-economic damages and were found to be 30 percent at fault, an award of damages would be reduced by 30 percent. This is a fair and reasonable standard, especially when compared to the negligence standards used by other states. For example, in some states, if a plaintiff was deemed to be over 50 percent at fault for causing a tractor accident, they will be barred from recovering any monetary damages. Other states have adopted an even harsher contributory negligence standard that bars a plaintiff from recovering damages if they are just 1 percent at fault. Generally, you have two years from the date of the tractor accident to file a lawsuit in a California court. If you wait any longer, you run the risk of losing your right to seek monetary damages from the at-fault party. However, there are some circumstances where a plaintiff can “toll” the statute of limitations. They include when: (i) the plaintiff was mentally incompetent during the time in which the statute of limitations was running, (ii) the plaintiff was physically incapacitated and was therefore unable to actually file the necessary legal paperwork; or (iii) the plaintiff was a minor when the accident occurred meaning that the statute of limitations does not begin to run until the minor becomes a legal adult. As you can see, the exceptions are quite narrow for when the statute of limitations can be tolled. This means it makes more sense to take action as soon as you can. The best way to do this is by contacting an experienced tractor accident attorney to discuss the viability of your potential claim. If you are struggling with massive medical bills and lost wages, you may be hesitant to schedule a meeting with a lawyer out of fear that you will be obligated to pay the attorney a huge hourly fee. Do not make this mistake. Tractor accident lawyers operate on a contingent fee basis. This means you pay no upfront costs and you can still access a high quality, experienced, and skilled personal injury attorney. It also means that you do not pay until the attorney secures a financial victory for you. Once victory is attained, the lawyer typically receives a percentage of the total amount of recovered. 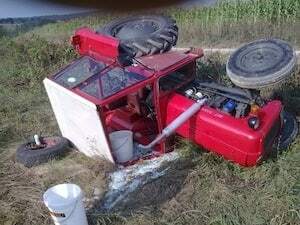 As you can see, hiring a California Farm Tractor Accident Lawyer is low risk with the potential for a high reward. The sooner you contact a California farm tractor accident attorney, the more likely you are to achieve a favorable outcome in your case. I’m Ed Smith, a California Farm Tractor Accident Lawyer. If you or someone you love has suffered injury or death in a tractor accident, my heart goes out to you. Please give me a call for free, friendly and compassionate legal advice at (559) 377-7676. I’ve been helping the seriously injured in California recover the compensation they deserve for over 35 years. I also help families pursue a wrongful death claim when they have lost a loved one in a fatal tractor accident. It is free to call and talk to me. Just ask for Ed. Remember, I take my cases on a contingency fee basis, which means you pay no fees up front. I get paid after the successful outcome of your injury or wrongful death case. So why not call today? Español hablado aquí. I am a Million Dollar Forum member in the state of California. Forum members are ranked top US injury lawyers. Each accident lawyer in the forum has obtained a verdict or settlement that was worth in excess of $1 Million Dollars.